If you’ve been following recent news at all, you’ve no doubt heard the hubbub about the new documentary Vaxxed, which was pulled this week from the Tribeca film festival in New York, where the film was scheduled to be shown. Robert DeNiro is under fire in recent media, both for pulling the film from the festival and for stirring up the ongoing controversy around vaccine safety. Vaccine controversy is hardly anything new – it’s a question that parents have been facing for the last twenty years. As a doula, I hear “the vaccine question” from many families I work with. My answer is always, quite simply, “It’s not ever my role to give medical advice. This is, however, an important topic to learn about and have an informed conversation with your child’s doctor about the right decision for your own family.” I will gladly recommend evidence-based resources to support parents in educating themselves. Professionally, I’m Switzerland – as neutral as can be. I typically don’t even mention my own point of view, because it’s irrelevant to the decision another family may make. A quick Google search would have us believe that there are only two extreme schools of thought. One side of the fence says “All vaccines are bad, the general public is brainwashed” and the other states just as clearly that “all scheduled vaccines are necessary, and only the misinformed Tin Foil Hat Brigade thinks otherwise” There is, however, an often-unmentioned middle ground. This is one parent’s story of what living in the invisible no-man’s-land really looks like. Eighteen years ago, when my son was three months old, at his standard well-baby checkup he received three shots. Having been through the usual routine with my older child, this was nothing new. What happened in the aftermath, however, became a completely different story. My son had what is generally referred to as an atypical reaction. It’s nothing unusual for babies to run a slight fever and be a little cranky the day after shots. In the wee hours of the night, a few days later, however, my baby wasn’t just fussy, he screamed. I don’t mean he cried very hard – this was a high-pitched, piercing wail that lasted for hours, unending. He ran a high fever. The soft spot on his head began to bulge. The membrane that surrounds his brain was swelling. This is called encephalopathy. The Center for Disease Control, the same CDC that advocates for routine scheduled vaccination, notes that this encephalopathy is a real, though rare, known possible side effect of one of the three vaccines he had received. Our doctor provided excellent medical care, and access to solid information. The US government has a Vaccine Adverse Event Reporting System in existence since 1990, and a VAERS report was filed about my child. I am acutely aware that this is unusual, though the exact statistics of specifically how uncommon are harder to pin down. The Center for Disease Control (CDC) states that “approximately 30,000 VAERS reports are filed each year. About 85-90% of the reports describe mild side effects such as fever, arm soreness, and crying or mild irritability. 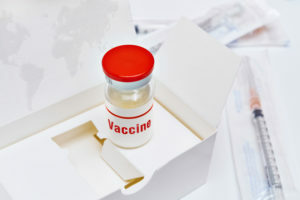 The remaining reports are classified as serious, which means that the adverse event resulted in permanent disability, hospitalization, life-threatening illness, or death.” The probability of serious adverse effects is minimal, with only 3000-4500 serious adverse effect reports per year, out of the over ten million vaccines adminstered per year to infants under the age of 12 mos. This statistic can be reassuring to some parents. However, when your own child becomes the statistic, the viewpoint changes. The challenges we have faced were only beginning. My baby stopped smiling and cooing. His milestones, like rolling, crawling, and walking were delayed. Other developmental delays began to follow. Speech delays caused him to be only minimally verbal until the age of six. He didn’t develop a dominant hand (become left- or right-handed) until seven. He was in physical and occupational therapy until the age of eight. A visual disability thrown into the mix meant that learning to read at all was delayed until the age of nine. Writing with a pencil (illegibly, but intentionally) wasn’t obtained as a skill until age 11. He didn’t sleep through the night until he was 12 – years, not months – when it was finally accurately diagnosed that an existing neurotransmitter deficiency requires medications that tell his body when to wake up and when to fall asleep. He has moderate multiple sensory processing challenges, and an autism spectrum diagnosis. It has taken many qualified and dedicated professionals to figure out how my kid learns, working as a team to ensure his success. He was homeschooled or tutored at home until fifth grade, when he was mainstreamed into school with a 504 (a document that provides exceptions for children with disabilities) and an Individual Education Plan (IEP.) This is the reality of living with a special needs child. So, do I believe that vaccines cause autism? Put simply, no. Current evidence bears proof that most reactions, if they happen at all, are mild, and the benefits outweigh the risks. Most children who receive them will be fine. My child, however, will not receive another one. With no explanation for why the extreme reaction happened, it’s not worth the risk to his health and safety. I’m grateful for herd immunity that occurs when most children are vaccinated against disease, because that’s what keeps my child safe from these diseases. On a positive note – he’s come a long way. In a month, he’ll be graduating high school with honors and will attend college on an engineering scholarship. He’s in the National Honor Society, plays on the football team, loves to act and sing, and has a fondness for really corny jokes. Social skills have had to be vigilantly taught in baby steps, and he’ll never be neurotypical, but he’s going to be ok. He’s a little awkward, perhaps, but given that he’s going to be an engineer, it’s possible nobody will find that strange. I don’t blame “modern medicine.” I like aromatherapy and all, but if my kid has appendicitis, we’re going to the hospital. I’m aware that the highly-publicized “MMR Causes Autism!” Andrew Wakefield study from 1998 has been debunked. I don’t think our pediatrician was participating in any sort of conspiracy or “cover up” when he recommended vaccinating our baby. While I do also believe that diet and lifestyle are important factors in everyone’s health, I work within the health system. I’ve witnessed lives being saved by modern medicine with my own eyes. I run an evidence-based doula practice, and I believe in science. My son has been seen by numerous specialists, including heads of department in a reputable children’s hospital. All of that said, the missing piece here becomes glaringly obvious. We still don’t know why this happened, and we are not alone. Parents across the country, another 3000-4500 serious VAERS reports per year, are telling their stories of similar events. Their babies were fine, got vaccines, and weren’t fine anymore. Some have serious illness, and some are no longer living. With 23.2 million children under the age of five living in the US at the time of my son’s birth, even being one in 10,000 is no longer a small number, and it’s only growing larger. Most children will be fine. A small percentage will have reactions that are classified as severe. That small percentage happens to a few thousand children a year. Unfortunately, none are born with stickers on their foreheads that say, “I’m the one who’s going to be injured,” but there is hope that perhaps there are other clear signs that we can learn to see. This is worth attention. We need to learn more. There are many theories currently being suggested by respected medical authorities. Is there a genetic component that makes some children more vulnerable to adverse events than others? Maybe. I have multiple autoimmune diagnoses, and my son’s father had severe mental health issues. In fact, at the age of 40, my son’s father had an adverse reaction to a routine Hepatitis B vaccine, developed a lesion on the cerebellum of his brain, and was hospitalized for a week. Were environmental factors involved? Maybe. We do live in New Jersey, where the autism rates in the US are at their highest, along with our air and water pollution levels. Or, on the other hand, perhaps our early autism screening system just works more effectively in New Jersey than it does elsewhere. The thing is – we don’t know. Science can’t tell us yet how to discern who will be fine, and who is more likely to not be fine. “Why did this happen?” is a question that my family, and many others like mine, still have unanswered. This is where research is leaving a gaping hole. Studies are being conducted left and right to prove that vaccines don’t cause autism. What isn’t being focused on, however, is the answer to WHY, exactly, these serious reactions happen to some children and not others, and what we can do to make it safer for everyone. What’s being brought to light, here, is that research needs to be done on the “maybes,” so that they become answered. When we know more about the facts, when we learn the “why,” we can make a more effective plan than “It probably won’t happen to you.” This happens. It’s rare, but real. I’m not angry, but I am aware. The parents who live with this reality are simply asking for answers. All we’re looking for is the truth. No tinfoil hat required. My child was affected by something after being vaccinated. He is sensitive to MSG and all of it’s affiliates. I believe after tons of research on my own that his little body could not take the ‘triple threat’ because of the mercury overload. The industry has taken mercury i.e. ‘thimerisol’ out of vaccinations — why? Sad thing is they replaced it with something they have not proven is unharmful. We are guinea pigs to the medical industry. The few that experience reactions don’t matter to them if the majority show no ill effects. Thimerisol/mercury is the cause of autism for individuals with low tolerance to it. Period. “talk to your doctor”? they don’t learn anything in medical school about vaccines except that they are good. Most haven’t even read the insert which means informed consent does not occur. The double blind trials to test vaccines are unscientific and no one else does it; they give the the adjuvant to the ones who are supposed to be getting a placebo, not scientific, especially when you understand it is the adjuvant in the vaccine that is causing autism, not the vaccine.